WHO'S YOUR SCIENCE FICTION HERO? A new "Museum of Science Fiction" is kicking off in Washington D.C. In their online preview, the MSF appeals to fans from all over the great galactic divide with their fascinating website. Do you get that special pang when you turn on the tv and Star Trek or Star Wars flashes in front of you? Well then trekologist, you're in for a treat. Science Fiction stories unlike tales of horror - frequently entice fans to explore strange, new worlds in distant galaxies spreading peace, scientific progress and technology. Sci-fi's epicness encourages us to eat, breathe and evolve into fully fledged time travellers. As per Starfleet's Standing Orders, its my job to investigate such anomalistic phenomena and report. The obvious question here to ask is "Will D.C's Museum of Science Fiction catch on?" I think its cool Science Fiction continues to grow and infect humans throughout time. We're all living proof of that. Why do we reach for other planets, develop new technologies and want to meet aliens? At the MSF thoughts take on physical shape revealing the "fun" aspect of why we want to do these things. Its only logical to believe fans will want to trek out and see the fun exhibits with historical artefacts, including: full size space vehicles, robots, voice activated space probes and of course cool aliens. The MSF Executive Director, Greg Viggiano explained "Our approach begins with a web-based blueprint—an online museum. You're visiting it now. This blueprint allows you to see our progress, make suggestions, and share your ideas." Its a dream thats spreading throughout the stars and will make its debut at a full scale facility within 24 to 36 months. Right now money raised will kickstart the project into life. The museums Crowdfunding campaign is attempting to raise $160,000 in 38 days. 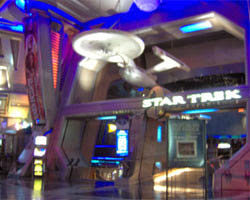 Meanwhile, The preview museum will house a number of Star Trek filming props from renowned collector Adam Schneider. A cool podcast is available with Adam giving a talk on the restoration of Star Trek's Shuttlecraft Galileo! Gary Cannavo has offered to loan the MSF Preview Museum the actual filming miniatures used in the 1970s production of the Battlestar Galactica motion picture and television series. Plenty of artifacts and display objects from film, literature, and art, along with prototype analog and digital interactive exhibits are in the pipeline. Image Credit: Howard and Jane Frank Collection. So how about it? Are you ready to book your interplanetary MSF flight? Whats your instinctive science fictional reaction? Whats the name of the spaceship in the top three photos? Where was the last one taken? Live Long and Prosper Terrestrian Time Traveller! This week I found Seaturtles video with a cool slideshow of 100 sci fi movie "classics" originating from 1927 to 2009. Many of these 100 Science Fiction movies have robots, cyborgs and alien entities sparking our sense of wonder by taking us to the edge of the universe. Fantasy epics and Space Operas like Avatar and Star Wars are well known. So sit back and enjoy the sci fi slideshow. In general, science fiction films feature great story plot elements, striking artwork and epic character interplay from a scientific viewpoint rather than a supernatural one. "Ancient astronauts museum" sums these classics up very nicely... Wrath of Khan is battling it out at number 70 along with four other Star Trek movies. Star Wars (1977) is sitting pretty at no 5. A couple of black and whites like Metropolis and H G Wells' "Things To Come" are featured but why Eternal Sunshine of a Spotless Mind made no 57 is a mystery. How does your geek feel about the sequencing of these classic sci fi movies? Watching the video is certainly a good way of testing your sci-fi movie knowledge in a showdown with some friends. So let the battle of wits begin. Which science fiction movies are your favorites? Enjoy your Trekking Trekkers, Terminators and Movie Addicts! Worf says: Women Roar, Men Duck. Sorry guys for missing the 'I Miss You Blogfest.' I was warping across the galaxy when my Shuttlecraft reactor engines blew out, 90 light years away cut off from Ninja Command!!! Heres a little Sci Fi clip with Data and Worf to to make you laugh. By sheer cosmic chance I was rescued by fun loving Risian spacebabes, who took me in and freely shared their planet with me. It soon emerged that natives were actively pursuing Jamaharon and I was their prey! So in over my head, I had to tell them about my passion for Star Trek. To be sure Risas' a Nice Planet! The sophisticated weather patterns are so relaxing. During my pleasure experience, I was duly presented with a Horga'hn. Now you do know what a Horga'hn is? Believe me, I was thinking about Earths' happy sphere of bloggers the whole time. Whats Quarks secret? Trekkers? Trekkies? In Star Treks classic 14th episode, "the Galileo Seven" is dispatched by Captain Kirk to investigate a mysterious quasar like formation. "An opportunity for scientific investigation" emerges but all is not what it seems. Mr Spock, Lieutenant Commander Scott, Dr. McCoy, Lieutenants Latimer, Gaetano, and Boma, and Yeoman Mears gear up for the special mission. So far, so good. But when the "Class F" Galileo gets pulled into the heart of the spatial disturbance, treks melodramatic drums start beating, doom, doom, doom, doom, hehe. Yes these sound effects are hilariously goofy by modern standards but you got to love these quirky sounds. These "clues" reveal when a situation is getting critical and whats going down. Boma confirms radiation from the spatial formation is "extremely disruptive" and time for Galileo crew is running out. This is Mr Spocks first shuttle command. Subspace communication, sensor scanners and transporters are neutralized by the spatial disturbance cutting the Galileo off from the Enterprise. Its not looking good. Eventually Muraski's ion storm forces the Galileo to crash land on Tarus II. Ion cloud radiation is also hampering Captain Kirks search and rescue operation. To make matters worse, Galactic High Commissioner Ferris is spouting rules and regulations thwarting the Captain. Uhura confirms the Galileo is pulled off course. Its a catch 22 scenario when the shuttlecraft Columbus returns empty handed. So now the Galileo crew are on their own with depleted fuel reserves, on a planet inhabited by Giant furry aliens. Heroically, two junior crew members die defending the ship. In true logical vulcanian fashion, Spocks analytical appraisal of the furry aliens weaponry nearly sends the Enterprise's Astrophysicist Lieutenant Boma diving off at the deep end. SPOCK: "A bit more crude about the shaft, I believe. Not very efficient"
BOMA: Not very efficient? Is that all you have to say? SPOCK: Am I in error, Mister Boma? Perhaps Boma is being disrespectful and insubordinate to Mr Spock? Remember this is war on a hostile alien planet. The vulcans strategic logic apparently gives the Galileo crew the edge they need for survival. Except the human "unpredictable element" towards Latimers death runs high. Star Trek's Galileo Seven is so undeniably fun with such an evocative storyline. Dr McCoys emotional outburst aboard the Galileo is totally epic, lol. "Now look, We may all die here! At least let us die like men not machines! So when the Giant Furry Aliens come back to bash the Galileo to bits, the crew understandably begin to panic. Red Alert! Spock has an emotional epiphany! Pure vulcan logic failed to frighten the scary giants? Impossible! But you've got to wonder. Whats the point of having phasers with amazing stun settings? I bet pointy ears kicked himself for not listening to Gaetano. The poor dude actually predicted Spocks would get him killed! Top trek tip. Don't argue with command or you'll get the redshirt treatment, hehe. Spock abandons Gaetano on guard duty, alone and ready to be murdered. Re-energizing the Galileo's fuel reserves with phasers to escape the gravity of the planet is what really counts. Good ol' Scotty saves everyones bacon or was it Mr Spock's shuttlecraft distress flare? Which do you think is the coolest? Who really saved the Galileo crew? Live Long and Prosper, Trekkers.